Back from the Brink is an antidote to a world that seems full of stories of wildlife doom and gloom. Amongst all the loss of habitat and the animals and plants that are in spiralling decline, it’s easy to forget that there are a huge number of positive stories too; animals threatened with extinction, such as the gigantic European Bison – extinct in the wild – having their fortunes reversed and their futures secured. This is the story of some of these successes. How the Humpback Whale, in seemingly terminal decline because of commercial whaling, is today recovering naturally, getting back to the numbers that swam in our oceans before they were viciously harpooned. Others have needed considerable help such as the enigmatic Arabian Oryx, the origin of the unicorn myth, that was reintroduced to the fabled Empty Quarter deserts of Arabia where over a thousand again roam. These are stories of enormous personal courage, dedication and patience by those protecting animals like the Black Rhino; of reinstating damaged or destroyed habitats for predators such as the enchanting Iberian Lynx; and of reintroducing birds such as America’s tallest, the Whooping Crane, to places where they once thrived but had long gone. 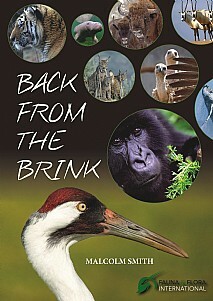 Back from the Brink recounts the struggle to win the support of local communities to accept and bolster the populations of some of our largest animals such as the Mountain Gorilla – one of our closest relatives – and the magnificent Siberian Tiger, both of which once seemed destined for extinction. The re-introduction of the Wild Turkey, extirpated from most American states by early white settlers, was successful because of biologists’ ability to learn from early mistakes. The gorgeous Large Blue butterfly – extinct in England by the 1970s – would not be thriving today without the incredible investigation that unravelled its complex living requirements, a lesson in detection that would have challenged Scotland Yard’s finest. And others, like the gentle, lumbering Florida Manatee, its numbers recovering very slowly in part due to enormous public support. It’s the kind of care and consideration that Man needs to share to make our planet a richer place for us all. This will be of immense appeal to everyone with an interest in nature, wildlife and conservation and who enjoys a good read.